You Select the Tune for Your Special Gift! Celebrating Our 23rd Year Online! Gifts for all ages including children, baby, boys, girls, women and men. 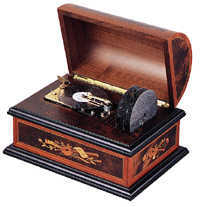 We feature music boxes from around the world including Mr Christmas , Gold label, San Francisco Music Box Company, Reuge of Switzerland the "Rolls Royce" and Porter both famous for their meticulous handcrafted inlaid Italian workmanship. Also featured are a large selection of unlque musical items that you will not find listed anywhere but on Gifts Online Inc.
Our selection includes angels, ballerinas, cupids, children's, carousels, custom music boxes, water globes, singing birds, musical pocket watches, miniature instruments and whole lot more, including Reuge and Porter disc players. We also feature Miniature Instruments, some even include wind-up musical movements that play a famous melody when wound up with a brass key usually located at the back of the instrument and look just like the real thing! We carry more than 700 Tunes, and on many items you can choose your own song. If your the handyman, craftsman type who likes to build your own box, we have a large selection of Reuge and Sankyo movements in all sizes for your projects. We have to many gift ideas to list here, so browse all the categories inside. We also have a collection of miniature clocks, absolutely adorable with Japanese, high quality movements. Check them out! Very cute! You will also find a variety of delightful children's wooden pianos for kids ages 1 to 10 ready for the young piano player to learn to play. Made in the USA by Schoenhut Piano Company for over 100 years and built to last a lifetime. Gifts Online Inc. All rights reserved.